When my oldest was little, I came up with different variations of what we called “roll-ups.” Basically it’s anything you can smear, stuff, layer and roll up in a tortilla. For some reason she just always loved roll-ups and would request them for every meal. For our Menu #7 in the Lunch Menu Series, I’m sharing one of my daughter’s very favorite roll-ups with you. Some lunch menus tend to be more like a second breakfast, and this is one of those menus. But it’s full of healthy proteins, whole grains, and fruit. 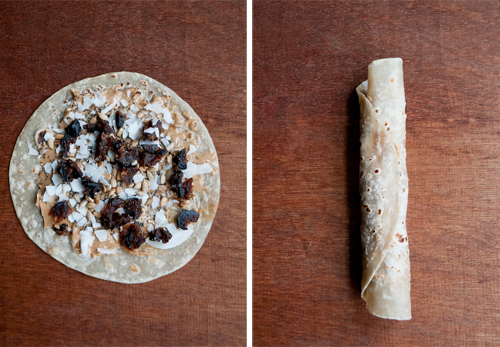 – To make the roll-up, start with your favorite kind of tortilla. Sometimes I use whole wheat, but they can be a little drier and more difficult to roll. I spread a thin layer of peanut butter across the entire surface. If your child’s school is nut free, you could easily substitute sunflower butter or even cream cheese. Next, I top with a light sprinkle of sunflower and chia seeds, unsweetened coconut flakes, and top with chopped dried fruit. For this particular roll-up I used dried figs and a large Medjool date, but I have also used raisins, cranberries, cherries, apricots and mangoes. Tightly roll everything up and let it sit for a few minutes and cut into pieces. Easy peasy! 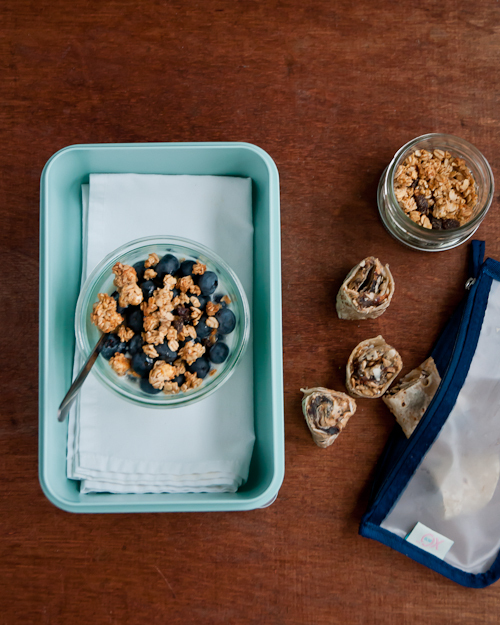 -Pack the granola separately and let your child add it right before eating so it stays crunchy. I’m loving these menus and the rolls are such a good idea. I also made the chewy granola bars you posted a few weeks ago and they are so great! My kids love them and I love knowing what’s inside. The roll-ups look interesting. I’ve never thought to put dried fruit and seeds on a wrap, but I’m game for anything and the soft-crunchy mix sounds yummy. I work in schools so can’t take peanut butter, but I could do cream cheese which would be delish.